Junior and Co-Photo Editor Maddie Holmes makes corrections on a spread during the yearbook lock-in production night. The Yearbook team has been busy all year working to create the 2018-2019 Gladiator Yearbook for the students and staff of their school. 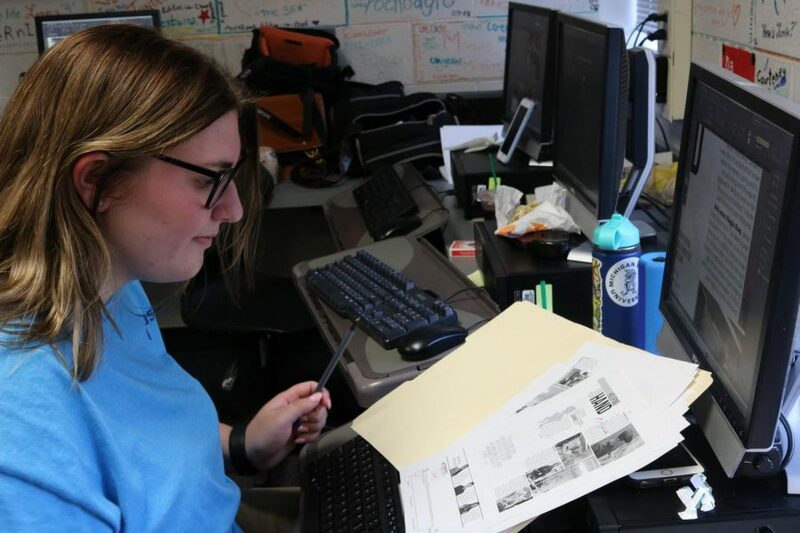 On Friday, March 22 the team got together one last time to put together the last 20 percent was a lot to the yearbook staff to finish before midnight, which was their goal. “I felt like there was never a moment where I wasn’t thinking about it or working on it,” Sandy said. Although some groups had a lot to work on, groups like the one senior Jiwon Byun was in, had finished already and came to be there to support her team whether it be by helping with spreads or just there verbally. “Being on the yearbook staff for three years just made me realize how I had the awesome opportunity to meet all these awesome people and share these memories with them,” Byun said. The yearbook titled “We See You” was finished before their goal of midnight, and now the team waits anxiously for it to arrive. “This year felt longer especially since it was my last year and I just wanted to get it done and have the book finally in my hands,” Byun said. Sandy loved having one last deadline to work with and hang out with her friends before the book was sent.